47118 Sat May 28 06:14:20 EDT 2016 Irineu Xavier Assuncao São Paulo , ot , BR As abelhas por aqui tem tem sedo exterminadas tanto pelos venenos do agronegócio quanto pelas prestadoras de serviços públicos energia, gás ,água e tel celular. Expulsa do campo os insetos melífluos se More....aninham nessas instalações,onde são exterminadas criminosamente por meio de baygon,spb, entre outros que são repelentes de mosquitos ! 47111 Thu Apr 28 11:16:54 EDT 2016 Anonymous Lake Worth, FL , US Europe banned systemics! They protested they just said no way, this is a no brainer. Why are we letting our Government letting these companies get away with this mass killing? 47109 Sat Apr 09 13:45:16 EDT 2016 Anita Buffer Warminster, PA , US IT IS IRRESPONSIBLE AND VERY STUPID TO 'NOT' PROTECT OUR POLLINATORS FOR THE SAKE OF CORPORATION PROFIT. 47108 Fri Jan 29 15:26:37 EST 2016 Roberta Brauner Ocean Shores, WA , SN Bees are dying right in front of our eyes here in WA! 47105 Fri Nov 20 20:11:21 EST 2015 Ronald Moen Livingston, TX , US It is unfortunate that we can no longer manufacture all the products we deem needed. The earth can not take it, our lives is to dependant on this lonely rock. Can we find other answers? I challenge More....you Bayer to bring your assets to the table, and help this place. A place that, as of yet is irreplaceable. The fallout or benefit of your actions await. We are your audience. 47101 Mon Jun 15 14:05:27 EDT 2015 Mary Wagen Long Beach, CA , US I am going to tell all the people that I can, not to buy the pesticide you sell that kills bees. You should be able to do better! 47100 Thu Jun 04 12:40:12 EDT 2015 Anonymous Spearfish, SD , US When you lose the bees you lose us. Think about the long term effect of short term greed. 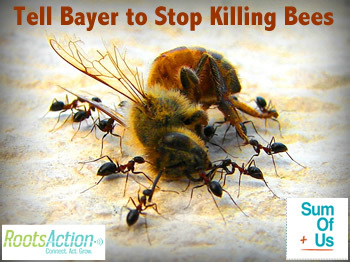 47099 Mon May 25 11:27:11 EDT 2015 Anonymous San Bruno , CA , US Please stop killing our bees!